Red Power: The government presented a budget for 2017. Who is this budget for? 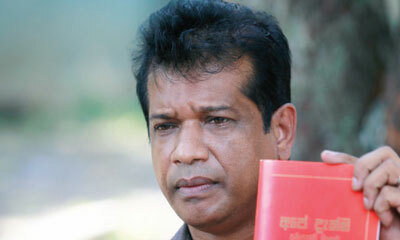 Comrade Lal Kantha: The government states it presented a budget. Of course, it is a budget for the government. But for the people in this country it is only expenditure. They do not gain anything from it. Whichever government that has ruled this country has talked about means for people to get an income so that they could conceal the taxes and fines imposed on the people and to stop disapproval of the people for the budgets. At the budget proposals presented this time while presenting it to Parliament, in debates Parliamentarians who spoke on behalf of the proposals never spoke about how people could get their incomes. They cannot do so as there is nothing in the budget to help people in their incomes. This is the programme that takes forward the policy of the government. It is a programme based on selling resources, high taxes and heavy fines. It is a programme that makes living a challenge for the ordinary folk as it talks only about heavy expenditure without any income. It is a programme that allows the government to while away for another year. Red Power: The government imposed VAT two weeks before the budget presentation and burdened the masses in addition to what was heaped on the masses from the budget. How would the masses endure the burden of VAT and other increases? Comrade Lal Kantha: All those who get permanent incomes are dragged towards a critical economic crisis through the budget. The self employed carpenter, mason, barber would increase their charges. Those in the informal sectors could do so. However, those in institutional and formal sectors such as government employees, employees in the private sector, those who get permanent incomes, even the farmer would have to confront the most difficult times of their lives. For, the budget doesn’t mention any means of income. Others will increase their incomes when taxes, fines are increased. The barber who cuts hair for Rs.150 would increase his fare to Rs.200. The producer would increase the price according to his expenses. The biggest blow from the budget is for the permanent income recipients. Even at this moment we are having this interview the budget debate is going on. We challenge the government to say how people could increase their incomes. There is no such thing in the budget proposals. People are unable to bear the burden of the expenses. Just as they were fed up with the previous regime, they would reject the two groups that are ruling the country now. They will have to take up the path of struggle for their existence. The people have a responsibility to understand that they cannot go further with the present day rulers. They will have to detach themselves from conventional political parties. They will have to choose a different socio-economic system. The existing state is not the fault of the rulers. It is no use blaming the rulers. For, they carry out their economic policy. Hence, as Brecht said bringing such rulers for power is the mistake of the people. Bringing such rulers to power and blaming them later is fruitless. The people should understand that it is necessary to defeat the rulers as well as the existing socio-economic system. It is the people who have to change. This is why Bertolt Brecht said the people should change. The solution for the issue is a different attitude of the people. The responsibility of the intellectuals and artistes in this country is undertaking the task of changing the people; to create citizens who become aware of their power. Red Power: The Minister of Finance is repeating the recipe given by the IMF. Proposals are brought to sell state institutions. Proposals are included to encourage privatization of education and health services. How do the working masses in these sectors confront this situation? Comrade Lal Kantha: The policy of this government is not taking part in production. Production is goods and services. The government is specially withdrawing from education and health services. The budget proposals are presented according to this policy. As such, allocations for health, education and agriculture have been slashed. The intention of the government is to go along with this policy. The government is not at all concerned about how many patients would die without medical attention, how many would lose their jobs, how many children will be denied education opportunities or how many farmers will commit suicide. This budget is disadvantageous to the people; it is harmful. Due to selling of state resources, excessive taxes and fines the working masses in the state sector and the private sector will take the path of struggle. There would be a struggle lead by these sectors. Other downtrodden masses too have a responsibility of joining these struggles to achieve victory. When the budget proposals are implemented in January, 2017 the masses throughout the country will have to enter the path of struggle. However, the struggles against these policies could gain a lasting victory only in a political arena. The people should defeat the traitorous policies of these governments on the very first opportunity they get in the political arena. Red Power: At the moment the working masses as well as all the people have been called for a common struggle. How do these struggles merge with the programme of the JVP of building a broad people’s force for a power transition? Comrade Lal Kantha: No party was given power to form a government of their own at the last general election due to the frustration masses have regarding the so-called main political parties. Using provisions in the Constitution they have formed an alliance government despite people not voting them to form such a government. In 2020 people will not vote for Maithri’s SLFP, Ranil’s UNP or Mahinda’s ‘bud’. As such, what they intend doing is to form a tri-party coalition government in 2020. It would be the most reactionary government in the history of this country. Even now the three groups are unofficially linked with each other. They use this state to escape from being punished for frauds, corruption and thefts. All fraudsters and their protectors would join to form a tri party coalition. Already, this coalition has been unofficially formed. This is why Minister Lakshman Kiriella participating in the budget debate says that Mr. Mahinda Rajapaksa should help them. The people should understand this situation and the hazard. Forming such a government should be prevented, all three reactionary forces should be pushed aside and a political movement that is capable of forming a people friendly government should be built. The JVP warned at the last election that the existing alliance government would be formed. Also, we said that thieves would never work against thieves. This has been proved. People have the responsibility of taking measures from now on to defeat the alliance of people’s enemies. People have a struggle before them to protect state resources, services they have partaken and punish fraudsters and the corrupt that plundered people’s assets. This struggle cannot be won from fighting only in one’s sector. It is a common struggle of all of us. We invite people to rally around the broad people’s front that is being built by the JVP that foresaw the danger and launched building the front.